The Institute has been created to help people of the world to achieve their purpose in life by providing practical, easy to use and proven spiritual tools. These methods and techniques will help you become enlightened and in doing so help you to find "your true work" in this time and this place we call planet Earth. The spiritual practices discussed on this web site are "in additional to, not instead of" your current religious or spiritual practices or traditions. Spirituality does not belong to any specific religion but to all people. Each component must be in balance and harmony with the others or we experience "dis-ease." 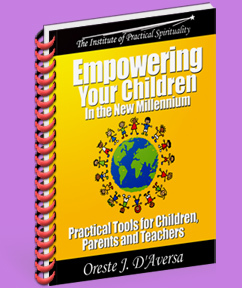 Get the knowledge to help you development and broaden your understanding on your spiritual path. Some of the tools and thousands of years old while others are more contemporary in nature, all are useful and all are helpful. Choose the spiritual tools that feel right for you. Not all of the tools will resonate or vibrate with everyone. There is the right tool that will help you on your path. These tools are provided in many different format; Books, eBooks (electronic books), Manuals, Audio CDs, Audio Downloads, DVDs, Tele-Conferences, Training Workshops, Individual Sessions, Telephone Coaching and whatever new technologies are created to reach people around the world. Success to you on your spiritual journey! I bid you love, light, prosperity, health and joy! "Our deepest fear is not that we are inadequate. Our deepest fear is that we are powerful beyond measure. It is our light, not our darkness, that most frightens us. We ask ourselves, 'Who am I to be brilliant, gorgeous, talented, fabulous?' Actually, who are you not to be? You are a child of God. Your playing small doesn't serve the world. There's nothing enlightened about shrinking so that other people won't feel insecure around you. We are all meant to shine as children do. We were born to make manifest the glory of God that is within us. It's not just in some of us, it's in everyone. And as we let our own light shine, we unconsciously give other people permission to do the same. As we're liberated from our own fear, our presence automatically liberates others." Need a Speaker at Your Next Event?